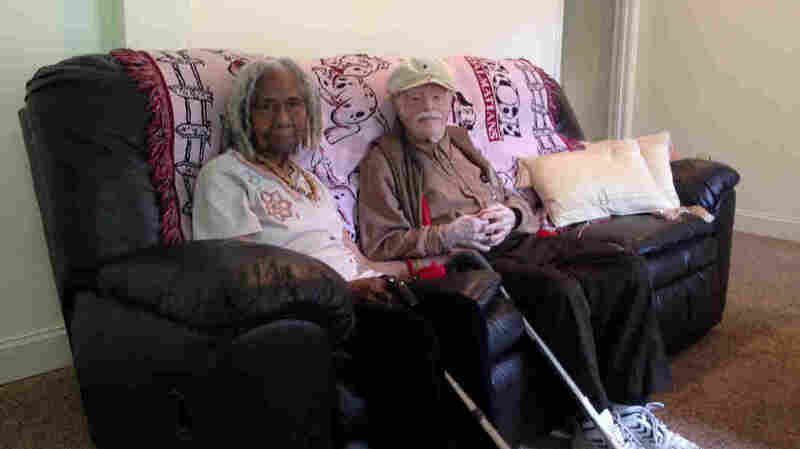 Marriage Of 96-Year-Old Woman Raises Legal Questions : The Two-Way The family of 96-year-old Edith Hill in Annandale, Va., says her sudden marriage to 95-year-old Eddie Harrison puts her estate into question. Edith Hill, 96, and Eddie Harrison, 95, shown here in their home in Annandale, Va., were married earlier this year. One of Hill's daughters says the marriage was improper and that Hill's estate is now in question. The recent marriage of two nonagenarians might seem romantic ... but the family of 96-year-old Edith Hill doesn't think so. The Associated Press is reporting a legal dispute in Alexandria, Va., between Hill's daughter Patricia Barber and Barber's sister, Rebecca Wright, who took their mother to marry 95-year-old Eddie Harrison. Cary Cuccinelli, Barber's attorney, said at a hearing last week that Hill has been declared legally incapacitated for many years and that Wright's decision to facilitate the marriage without court permission was "improper." Now, says Cuccinelli, Harrison has legal rights to Hill's estate, which includes real estate in the pricey Old Town area of Alexandria. Hill's property there is worth about $475,000. The dispute also claims the marriage complicates Hill's care and living situation. Judge James Clark agreed with Barber that the process of the marriage was improper, but he didn't want to immediately separate the newlyweds. He decided to remove both daughters as Hill's legal guardians and instead appointed another attorney, Jessica Niesen. Niesen now has the task of investigating the marriage and protecting Hill's interests. If Niesen finds that the marriage does not benefit Hill or her estate, she can pursue a divorce or annulment. But, she told the AP, she won't break up the marriage if she finds no damaging information. She also opposes the idea of a postnuptial agreement, which would deny Harrison access to Hill's estate. Niesen says the marriage should be given equal treatment if found to be a good arrangement for Hill. Hill and Harrison met more than a decade ago while waiting in line to buy lottery tickets. One of the tickets was a winner, worth $2,500, but both walked away with more than cash. The two have been companions ever since. A church elder presided over their marriage ceremony earlier this year. What makes this case particularly noteworthy is Wright's claim that Hill and Harrison may be the oldest interracial married couple in the country. Hill is black and Harrison is white. A legal marriage in the commonwealth of Virginia would not have been possible if the couple had met when they were young. In an interview with WUSA9, Harrison hugged Hill and said "we'll be like this always regardless of what happens." Hill and Harrison live in nearby Annandale, Va., with Wright and her daughter, Robin.